DEAL EXPIRED: Now through Nov. 7 (or while supplies last), Apple authorized reseller B&H is slashing the price of the upgraded 2015 12" MacBook (1.2GHz, 8GB, 512GB) to $1,099.00 exclusively for AppleInsider readers. This is a $500 discount off the original MSRP, making it the lowest price we've ever seen on these MacBooks, which are available in Space Gray , Silver and Gold . On top of the instant discounts, B&H will not collect sales tax on orders shipped outside New York State, and expedited shipping is free. This deal, which offers shoppers the lowest entry point to a MacBook entirely according to our Mac Price Guide , can be activated by using the links below. DEAL EXPIRED: Apple authorized reseller Adorama is exclusively taking $20 off 4th generation Apple TVs for AI readers using the links in this post and promo code APINSIDER. Both the 32GB and 64GB models, priced at $129 and $169.95 respectively, also qualify for free expedited shipping. What's more, Adorama will not collect sales tax on orders shipped outside NY and NJ, making this deal $32 to $45 cheaper for shoppers outside these two states on average compared to paying full price with tax at the Apple Store. 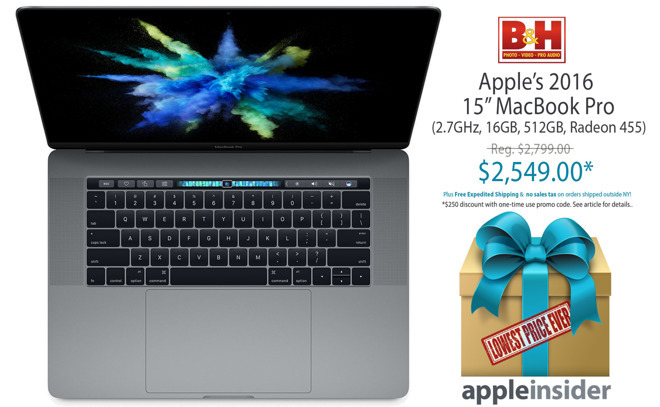 DEAL EXPIRED: Apple authorized reseller B&H is slashing the price of the brand-new Late 2016 13-inch MacBook Pro in Space Gray to $1,649.99 this week, a discount of $150 off MSRP. This 2.9GHz, 8GB, 256GB system also qualifies for free expedited shipping — and what's more, B&H will not collect sales tax on orders shipped outside NY and NJ. This means shoppers outside New York and New Jersey can save $290 on average compared to paying full price with tax at the Apple Store. 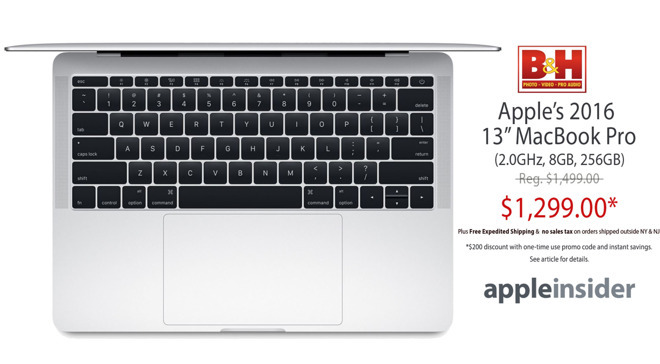 Apple authorized reseller Adorama is exclusively offering AppleInsider readers the lowest prices anywhere on Apple's Early 2015 13" MacBook Airs bundled with 3 full years of AppleCare, and then it's throwing in an official Apple Super Drive ($79 value) with each order absolutely free. What's more, each bundle also ships free and Adorama won't collect sales tax on your order if you ship it outside NY and NJ. To take advantage of this offer, apply promo code APINSIDER during checkout to get the advertised price. 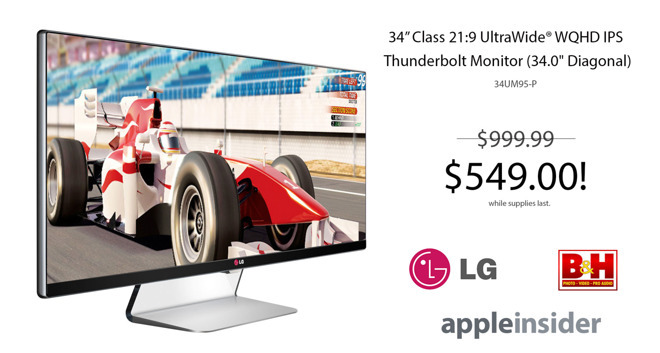 DEAL EXPIRED: While supplies last, AppleInsider readers can save $450 on LG's 34" 21:9 UltraWide IPS Monitor with Thunderbolt (model 34UM95-P), bringing the price down to $549.00 (requires coupon, read on..) with free expedited shipping. On top of that, B&H will not collect sales tax on orders shipped outside NY and NJ. This price is a record low for this display, according to our Apple Display Price Guide . In what is the lowest price seen from an authorized dealer, B&H is taking $200 off the DJI Phantom 4 Quadcopter with 4K Camera, bringing the price to $1,199.00 with free shipping. What's more, B&H will not collect sales tax on orders shipped outside New York and New Jersey, and they're throwing in a free 64GB SanDisk Extreme Memory Card, a $29.49 value. During our recent review of the DJI Phantom 4, we found it to be a top-notch choice for shoppers seeking an affordable drone thanks to speed boost in Sport Mode and Active Track capability. DEAL EXPIRED: Back in stock! Those wanting an iPhone 7 now can snap up a 256GB model in Black, Silver, Gold and Rose Gold for $829.99 ($20 off) with free expedited shipping. The Top Rated Plus seller states the units are brand-new and GSM unlocked, which makes them $87 cheaper on average compared to paying full price with tax at Apple. Quantities are limited; at press time, over 81% have been sold. DEAL EXPIRED: While supplies last, an eBay Top Rated Plus seller has Apple's 16GB iPad Air 2 models in Space Gray and Gold for $339.99 , a discount of $60 off MSRP. What's more, the seller does not collect sales tax outside of TX, making this offer $91 cheaper on average compared to paying full price with tax at the Apple Store. Plus, according to our iPad Price Guide , this deal offers shoppers the lowest price anywhere. DEAL EXPIRED: Apple authorized reseller Adorama is exclusively offering AppleInsider readers cash discounts with the purchase of Apple's most popular Late 2015 iMacs with HD displays. Systems also include AppleCare extended warranty protection plans, and each bundle ships free. Plus, Adorama won't collect sales tax on your order if you ship it outside NY and NJ. To take advantage of this offer, please follow the step-by-step instructions below and during checkout (right before your payment info) apply promo code APINSIDER to get the advertised price. DEAL EXPIRED: AppleInsider readers this month can use an exclusive coupon code to score $40 off iMac and Apple SuperDrive Kits with the purchase of many 21" iMac with Retina 4K display configurations. These deals from AI and Apple authorized reseller Adorama are made possible via a special batch of Mac + Apple SuperDrive bundles (linked below) and our exclusive promo code APINSIDER, which takes $40 off qualifying iMac and Apple SuperDrive bundles during checkout (coupon is valued at $90 in your cart). What's more, each includes free shipping, and Adorama won't collect sales tax on orders outside NY and NJ (another $100-$200 savings for most shoppers). DEAL EXPIRED: As 2016 winds down, B&H is taking $50 off 32GB and 128GB iPad Air 2 s in Silver, Space Gray and Gold with free expedited shipping. What's more, B&H will not collect sales tax on orders shipped outside NY and NJ, which makes these prices the lowest available from an Apple authorized reseller, according to our iPad Air 2 Price Guide. This week, Apple authorized reseller Adorama is slashing prices on popular 15-inch MacBook Pro configurations for existing customers [?] with AI exclusive promo code APINSIDER. Shoppers can save $50 to $290 off MSRP, and what's more, Adorama will not collect sales tax on orders shipped outside of NY and NJ. Plus, shipping on all of the configurations linked below is free. According to our Mac Price Guide , these prices are the lowest available from an authorized reseller by up to $210. DEAL EXPIRED: Today's Spotlight Deal on eBay features a 2013 11" MacBook Air (1.3GHz, 4GB, 128GB) for $479.99 with free shipping, which is 20% off the original MSRP. The Top Rated Plus seller states the systems are refurbished, but in very good condition. At press time, over 94% have been sold. DEAL EXPIRED: Exclusively for AppleInsider readers, B&H Photo is taking $500 off Apple's Early 2015 12" MacBook in Silver. This brings the price down to $799.00 — plus B&H is throwing in free expedited shipping and no tax outside NY and NJ. According to our Mac Price Guide , this is the lowest price currently available (and the lowest price we've ever seen). To activate the exclusive offer, use the link below from the AppleInsider desktop or mobile site. DEAL EXPIRED: Now through Dec. 22 or while supplies last, B&H is exclusively offering AppleInsider readers bonus coupon savings on Apple's current 13-inch MacBook Air with 8GB of memory, bringing the price down to $849.00 . This is the lowest price from any authorized reseller in our 13-inch MacBook Air Price Guide thanks to an extra $20 off with our exclusive batch of single-use promo codes. What's more, these systems are in stock and qualify for free expedited shipping. On top of that, B&H will not collect sales tax on orders shipped outside NY and NJ. This means shoppers outside these two states can save $230 compared to paying full price with tax at the Apple Store. DEAL EXPIRED: As the holiday shopping season kicks into high gear, deals are heating up on the original Apple Watch at B&H Photo. With discounts of up to $550 off and no tax outside NY and NJ, first-gen Apple Watches are now as low as $199.00. Top picks can be found below with more options on B&H's site and in our Apple Watch Price Guide . DEAL EXPIRED: This week, Apple authorized reseller B&H Photo is taking $120-$170 off select 13-inch MacBook Airs with models starting at $869.00 . These instant discounts are in addition to free expedited shipping for speedy delivery. What's more, B&H will not collect sales tax on orders shipped outside NY and NJ, making the 13" MacBook Air systems linked below $210 to $265 cheaper than paying full price with tax at the Apple Store. DEAL EXPIRED: For a limited time, Apple authorized reseller B&H is taking $100 off Apple's Late 2016 13" MacBook Pro (2.4GHz, 16GB, 256GB) without a Touch Bar, bringing the price down to $1,899.00 . On top of the instant cash savings, B&H will not collect sales tax on orders shipped outside New York and New Jersey. And expedited shipping is free for delivery before the holidays. According to our 13-inch MacBook Pro Price Guide, this is the lowest in-stock price available as other retailers are currently accepting backorders. DEAL EXPIRED: For a limited time only (and while supplies last), MacMall is exclusively offering AppleInsider readers an additional 3% off already reduced pricing on Apple's current 15" MacBook Pro featuring a 2.2GHz processor, 16GB of memory and 512GB of storage. Not only is this system currently $100 off, but AppleInsider readers can take advantage of an additional 3% off with exclusive promo code APPLEINSIDER01, bringing the price to $2,133.03 . This particular configuration is currently out of stock at other authorized resellers per our Mac Price Guide , making this deal the lowest in-stock price currently available. Offer ends on Oct. 28 or when supply runs out, whichever occurs first. DEAL EXPIRED: Now through Dec. 27, B&H is offering AI readers the lowest price ever on Apple's brand-new 15" MacBook Pro with 512GB of storage space and Radeon 455 graphics. This popular model in Space Gray (MLH42LL/A) is $200 off instantly, but with our exclusive one-time use promo codes, readers can save an additional $50 , bringing the price to $2,549.00 with free expedited shipping. What's more, B&H will not collect sales tax on your order if it's shipped outside NY and NJ, making this exclusive deal roughly $450 cheaper for shoppers outside NY and NJ compared to paying full price with tax at the Apple Store. To take advantage of this offer, please follow the instructions below to request a time-sensitive, one-time use promo code. DEAL EXPIRED: AppleInsider readers this month can use exclusive coupons to grab a free Apple SuperDrive in addition to cash discounts with the purchase many popular configurations of the 27" Apple iMac with Retina 5K display. These deals from AppleInsider and Apple authorized reseller Adorama are made possible via a special batch of Mac + Apple SuperDrive bundles (linked below) and our exclusive instant discount promo code APINSIDER, which deducts $90 (more than the full cost of the Apple SuperDrive) from the bundles during checkout. What's more, Adorama won't collect sales tax on your order if you ship it outside NY and NJ (another $100-$300 savings for most shoppers). DEAL EXPIRED: Those looking for Apple Pencil support can save $50-$70 on 9.7" and 12.9" iPad Pros with free shipping and no sales tax outside NY and NJ. According to our iPad Price Guide , these prices match MacMall's for the lowest currently available from an authorized reseller when factoring in tax (B&H does not collect sales tax outside NY & NJ, while MacMall collects tax in several states). 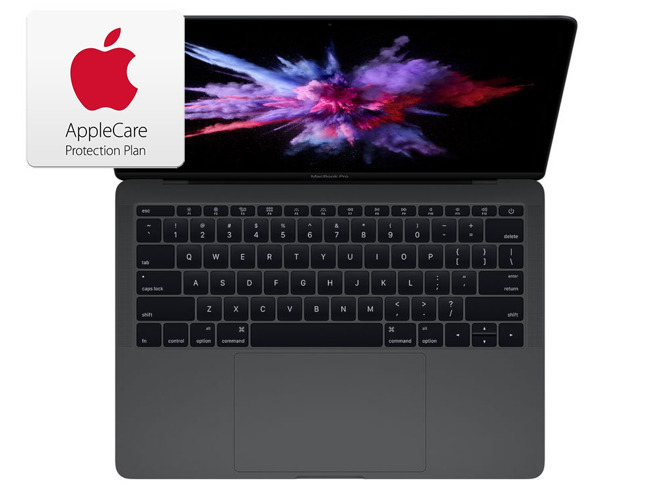 DEAL EXPIRED: For a limited time only, Apple authorized reseller Adorama is slashing the price of Apple's Late 2016 13" MacBook Pro (2.0GHz, 8GB, 256GB) in Space Gray with AppleCare to $1,499.99 , a discount of $248 off MSRP . Plus, on top of the instant savings, Adorama will not collect sales tax on orders shipped outside NY and NJ. This means shoppers outside of those two states can save $390 on average when factoring in 8% sales tax compared to paying full price with tax at the Apple Store. Those looking for the lowest entry price into a brand-new MacBook Pro without sacrificing AppleCare protection will find this deal beats competitors by $178, according to our 13" MacBook Pro with AppleCare Price Guide . DEALS EXPIRED: For a limited time only, B&H Photo is discounting multiple configurations of Apple's brand-new MacBook Pro by $100 to $200 and throwing in a free $50 or $100 gift card with select models. Plus, each system is in stock and ready to ship with free expedited shipping — and B&H will not collect sales tax outside NY & NJ. A full list of deals can be found in this post. DEAL EXPIRED: Apple authorized reseller B&H Photo this week is knocking up to $80 off MSRP on Apple's latest 12.9" iPad Pros, including WiFi only and WiFi + Cellular models. In addition to the instant discounts, each iPad Pro qualifies for free expedited shipping. Plus, B&H will not collect sales tax on orders shipped outside New York and New Jersey. According to our iPad Price Guide , these are the lowest prices available from an authorized reseller. DEAL EXPIRED: While supplies last, a Top Rated Plus seller on eBay has Apple's 2015 15" MacBook Pro for $1,599.99 , a discount of $400 off MSRP . On top of the instant savings, the seller does not collect sales tax on orders shipped outside NY, and shipping is free. This means shoppers outside of NJ can save $560 on average compared to purchasing the same model at full price with tax at the Apple Store. Plus, according to our Mac Price Guide , this deal is $250 cheaper than buying from an authorized reseller. DEAL EXPIRED: This week, Apple authorized reseller B&H is offering the lowest prices anywhere on several Early 2015 11" MacBook Airs with discounts of up to $150 off MSRP . On top of the instant savings, each model qualifies for free expedited shipping and many come with a free copy of Parallels Desktop 12 for Mac (OEM), a $79.95 value. Plus, B&H doesn't collect sales tax outside of NY & NJ. According to our Mac Price Guide , these prices are the lowest around without even factoring in the free gift.